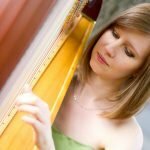 As one of Canada’s premier young harpists, Kristan Toczko is recognized for her radiant tone, expressive music making and scintillating virtuosity. A first place winner of the prestigious OSM Standard Life Competition, Kristan was recently named a CBC Radio-Canada Young Artist, and featured as a soloist in a nation-wide broadcast. Performing numerous concerti, Kristan has been featured as a soloist with the Vancouver Symphony, l’Orchestre Francophonie and Bathurst Chamber Music Festival. Kristan has also performed as part of the Ottawa ChamberFest, Toronto Summer Music Festival, Kincardine Summer Music Festival, Indian River Festival and has been an invited guest artist at the Banff Centre for the Arts numerous summers. She has also performed as principal harpist with several orchestras nationally and internationally, including the National Arts Centre Orchestra, Thunder Bay Symphony, Windsor Symphony, Symphony New Brunswick, Jalisco Philharmonia and Beijing Symphony. Kristan has toured twice with the National Youth Orchestra of Canada, and has participated in festivals such as the Aspen Music Festival, National Orchestral Institute, Orchestra of the Americas, Scotia Festival of Music and Lucerne Festival Academy. Kristan has performed with esteemed artists such as Measha Brueggergosman, Peter Oundjian, Matthias Pintscher, Sir Simon Rattle and Barbara Hannigan. She has played in such venues as Carnegie Hall, the KKL Luzern Concert Hall and Roy Thomson Hall. As a chamber musician, she is a founding member of harp duo “Duo Novus.” They have held an artist residency at the Avaloch Farm Music Institute, have commissioned several new works, and have toured internationally with the generous support of the Canada Council for the Arts. Kristan Toczko holds degrees from McGill University and Yale University, where she was awarded the first prize in both schools’ respective concerto competitions.